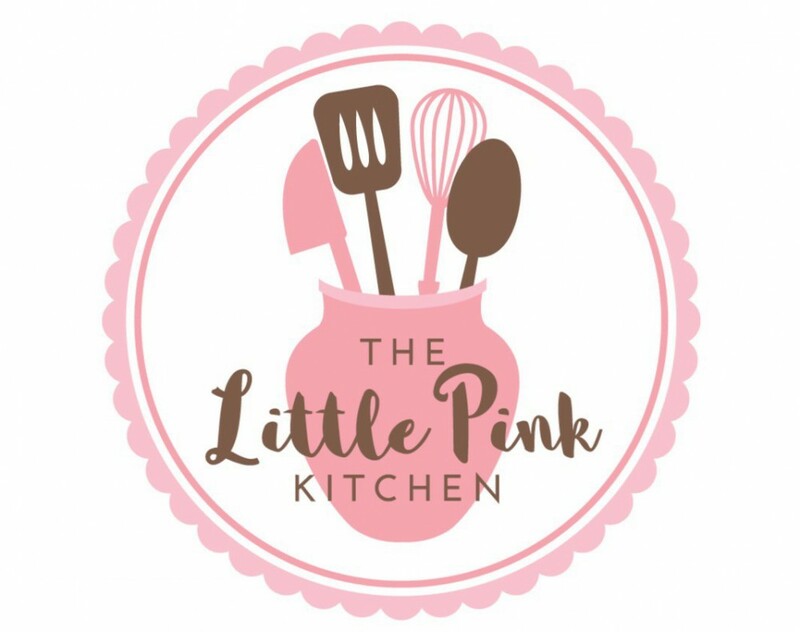 One of the great things about writing a food blog is having the opportunity to review new products, kitchen equipment or food. 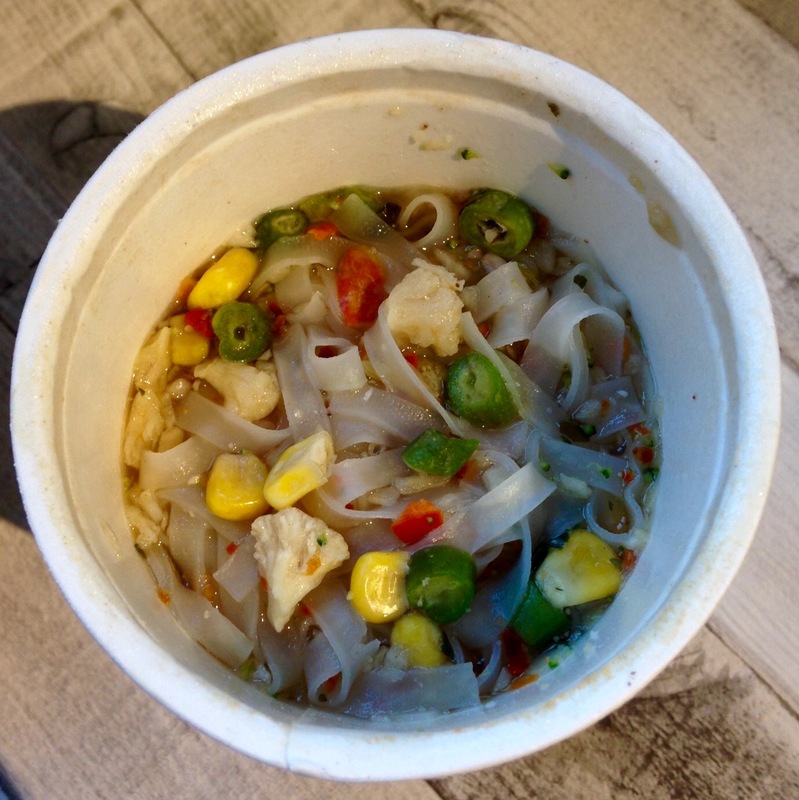 I was recently asked to try “Mr Lee’s Noodles” which are marketed as “Gourmet Oriental Noodles in a Cup”. 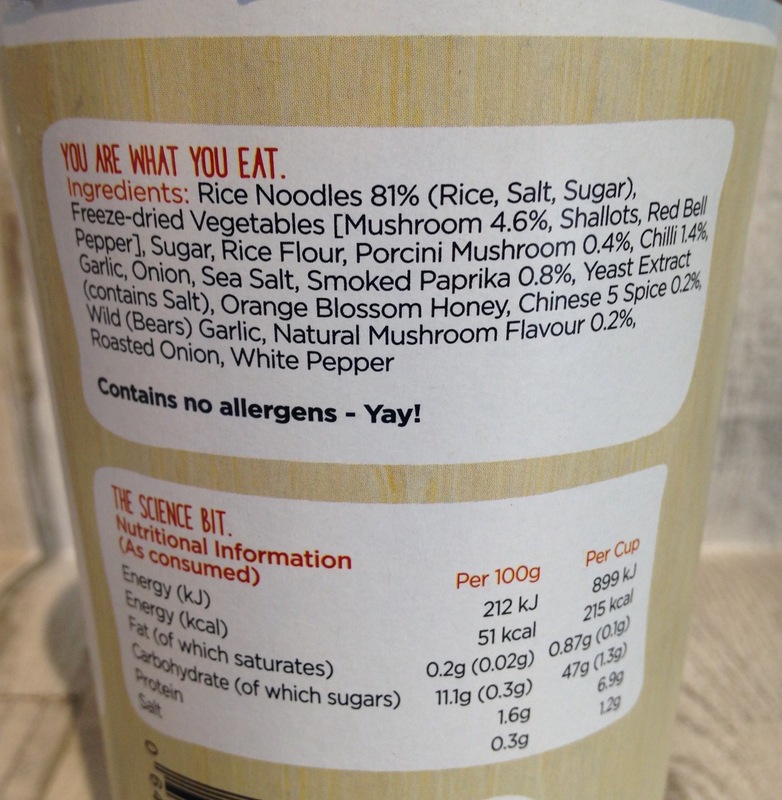 They are gluten-free, and contain freeze-dried ingredients which retain flavours better once reconstituted – as opposed to dehydrated – with “absolutely no nasties”. 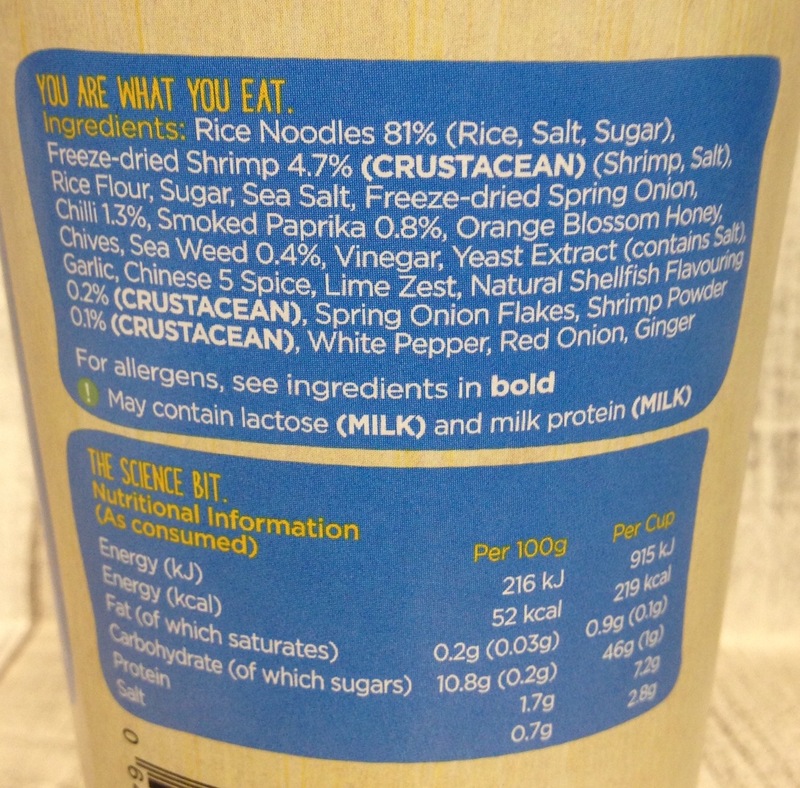 And there’s more – they’re low in salt, low in sugar, low in saturated fats and low in calories. All well and good but would they also be low in taste? 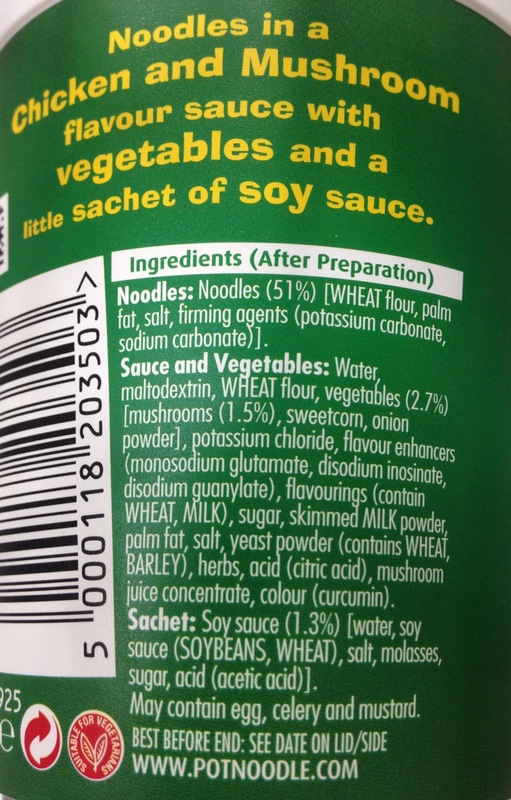 It’s disappointing for someone who’s trying to eat more healthily to see palm fat and monosodium glutamate in a list of ingredients and what exactly do things like potassium carbonate and disodium inosinate add to these noodles? If I don’t know what it is, I’m certainly not going to eat it. So onto the noodles provided by the team at Mr Lee’s. 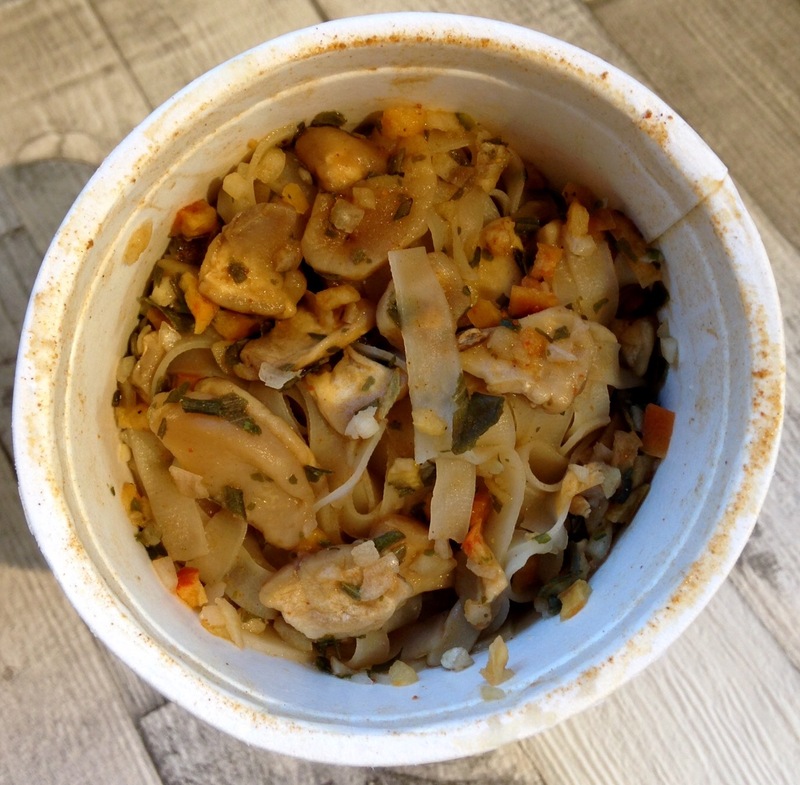 I spent a week trying out the six available flavours (noodles almost every day!) and you can see below what I thought of them. It’s worth bearing in mind that I’ve never tasted any other brand of instant cup noodle (I only photographed the chicken and mushroom Pot Noodle – it then went back on the supermarket shelf because the ingredients really put me off) so I couldn’t do a direct taste comparison with other noodles on the market. 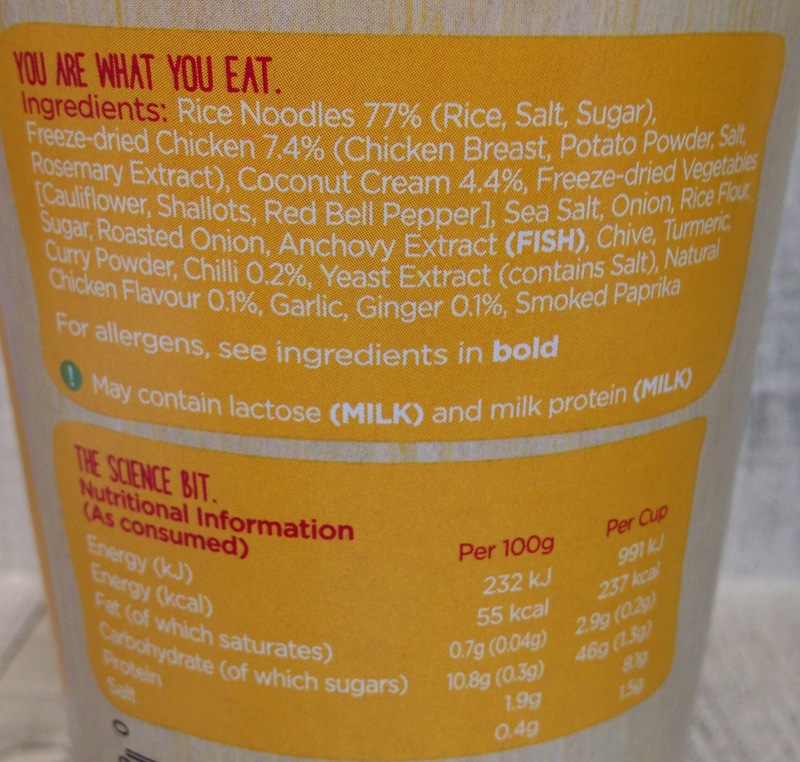 I took photos of the nutritional information panels of each Mr Lee’s flavour and there are indeed no “nasties” such as monosodium glutamate or palm fat. 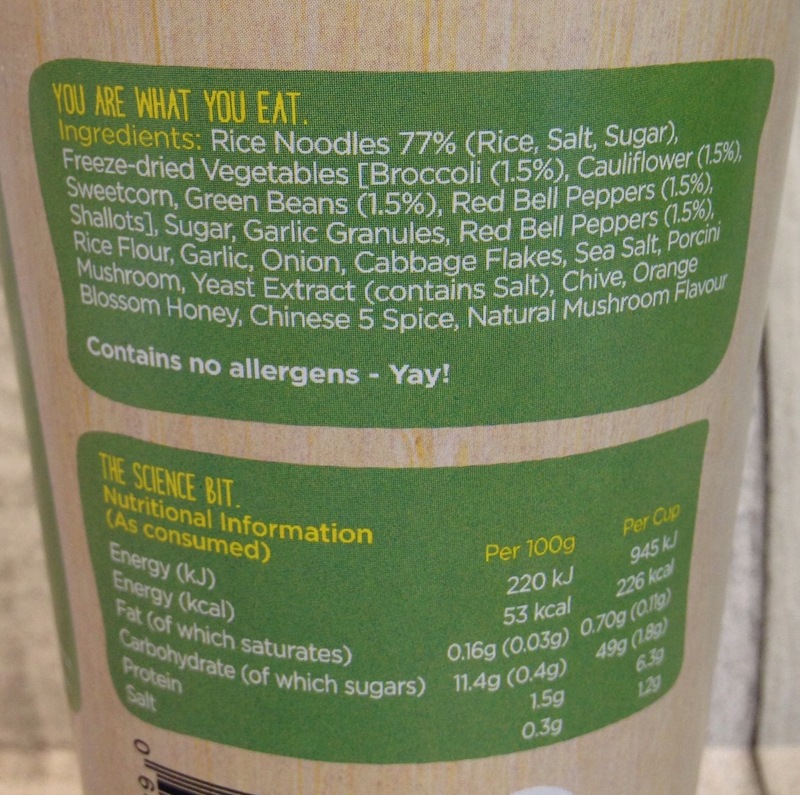 I’ve also calculated – for any Slimming World members who may be reading this review – the amount of Syns per pot and Mr Lee’s Noodles are reassuringly low Syn. As I’m a bit of a chilli wimp, I thought I’d start with a flavour that was classed as ‘mild’ ( one chilli rating) – Hong Kong Street Beef. 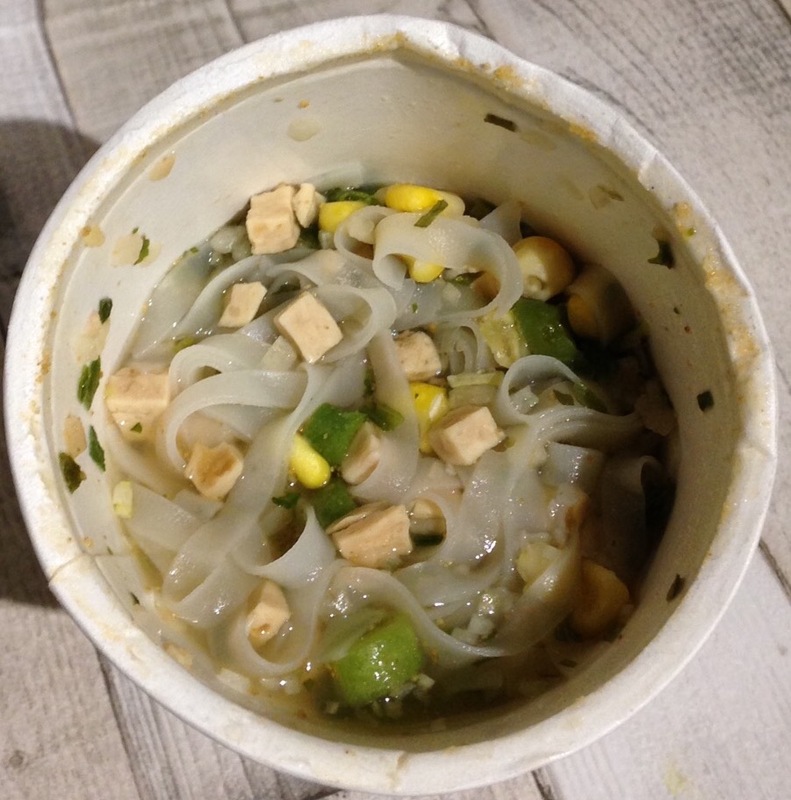 Mr Lee’s consist of rice noodles which I find are a lighter option than wheat noodles. Next I tried the Shaolin Monk Vegetable noodles. This flavour is suitable for vegetarians but not vegans as it contains honey. This flavour has no chilli rating. It had a good selection of vegetable pieces with cauliflower, green beans, red pepper and sweetcorn being particularly evident. Next came the Warrior Fighting Shrimp flavour. Now this flavour was rated “3 chillis” so I was prepared for quite a whack of heat. The first of two chicken varieties I tried was the Tail Chi Chicken. Once made up, this pot had quite a strong smell of chicken (not artificial) and the pieces of meat were clearly visible along with sweetcorn and green beans. Next I chose the Dragon Fire Mushroom pot. This had a rating of three chillis like the Warrior Fighting Shrimps and so I prepared myself with a glass of water and an electric fan – just in case. (Actually, I’m joking about the fan!) Reassuringly there were a lot of mushrooms in this pot along with red pepper pieces. When made up, the vegetables looked very substantial and the mushrooms weren’t slimy once reconstituted. The liquid was very well absorbed so it was less “soupy” than the other varieties I tried. 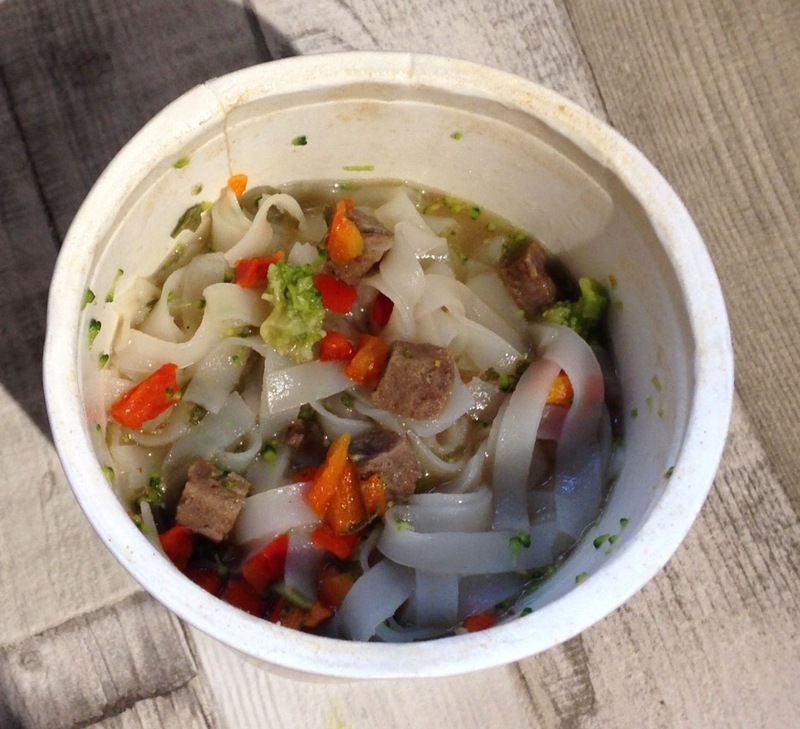 This pot had a mild savoury taste with a hint of wild garlic and surprisingly, given the three chilli rating, wasn’t as hot as I’d anticipated. I’d say it had an 8/10 chilli factor and as a result I managed to finish all of it. 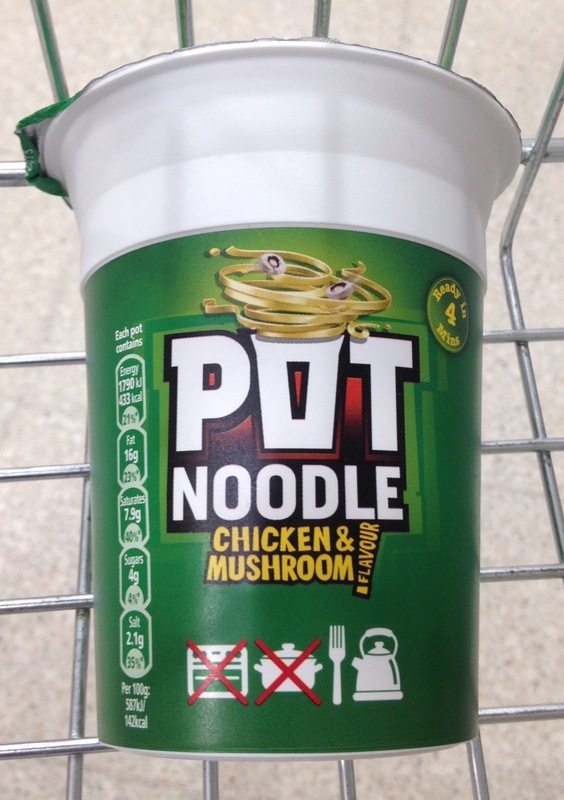 Slimming World Syn value – 1 ½ per pot. 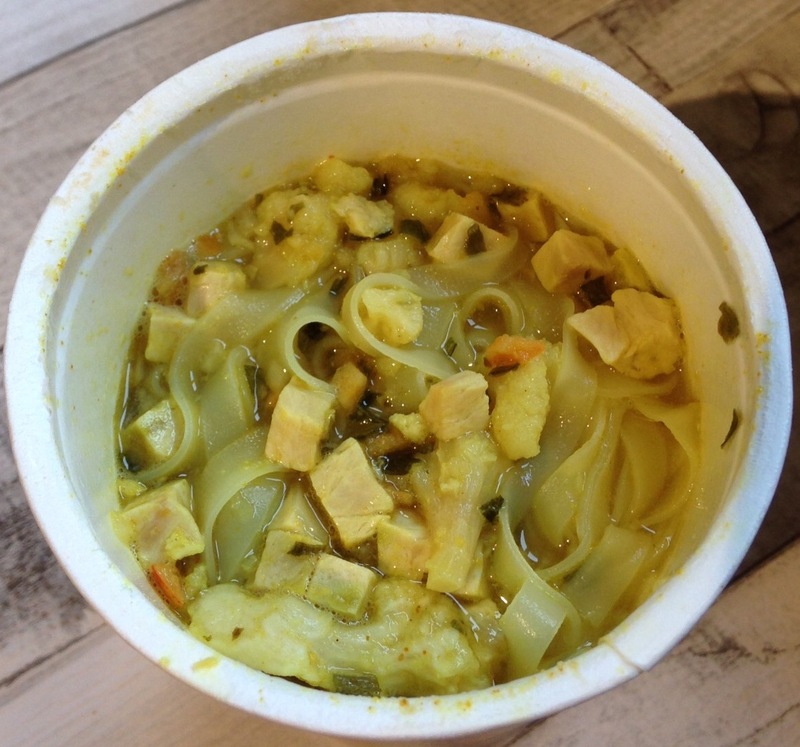 The final pot of Mr Lee’s Noodles was Penang Chicken Curry Laksa which had a two chilli rating so I expected a manageable medium heat. When prepared, this pot had a good mix of chicken pieces, cauliflower and red pepper. 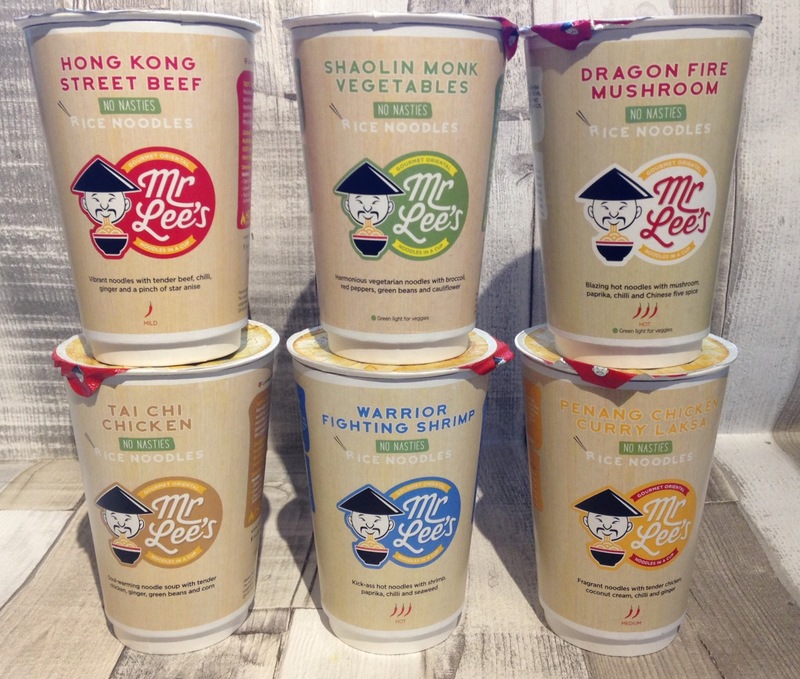 Having sampled all six varieties of Mr Lee’s Noodles, I would recommend them for occasions when you have to grab lunch on the go. Of course, I’ve given my honest opinion on each of the flavours based on what I like and the fact that I can’t eat food with too much chilli. Mr Lee’s Noodles would be a good cupboard standby for times when you can’t always cook from scratch e.g. when you’re at work as all you need is a kettle. All varieties are gluten-free and some flavours are suitable for vegetarians. 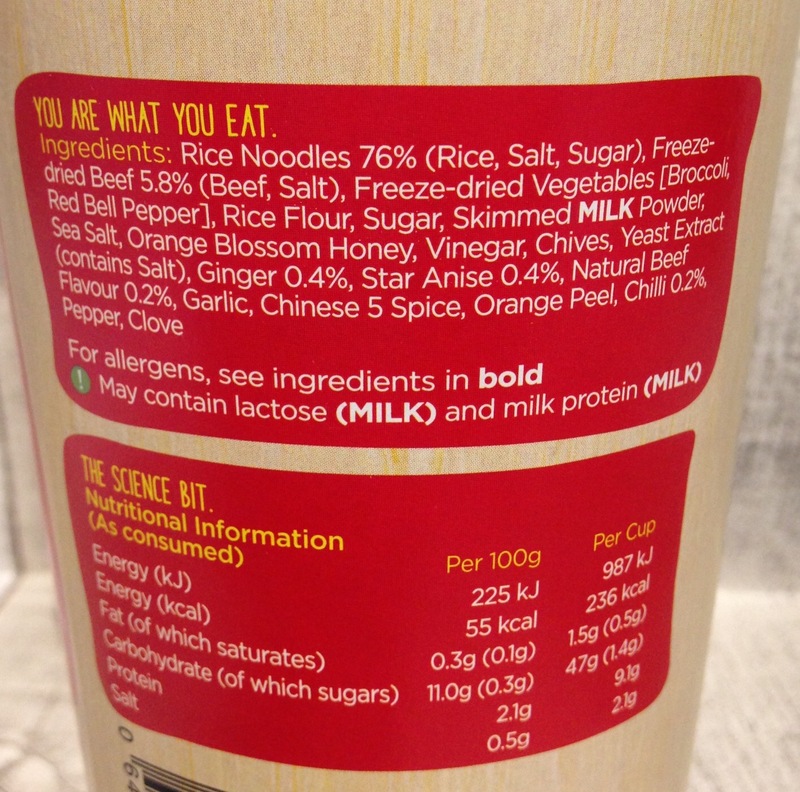 Slimming World members – Mr Lee’s Noodles are only 1 ½ or 2 Syns per pot whereas standard pot noodles (any brand) are at least 5 Syns – and may contain several unhealthy ingredients and fillers too. 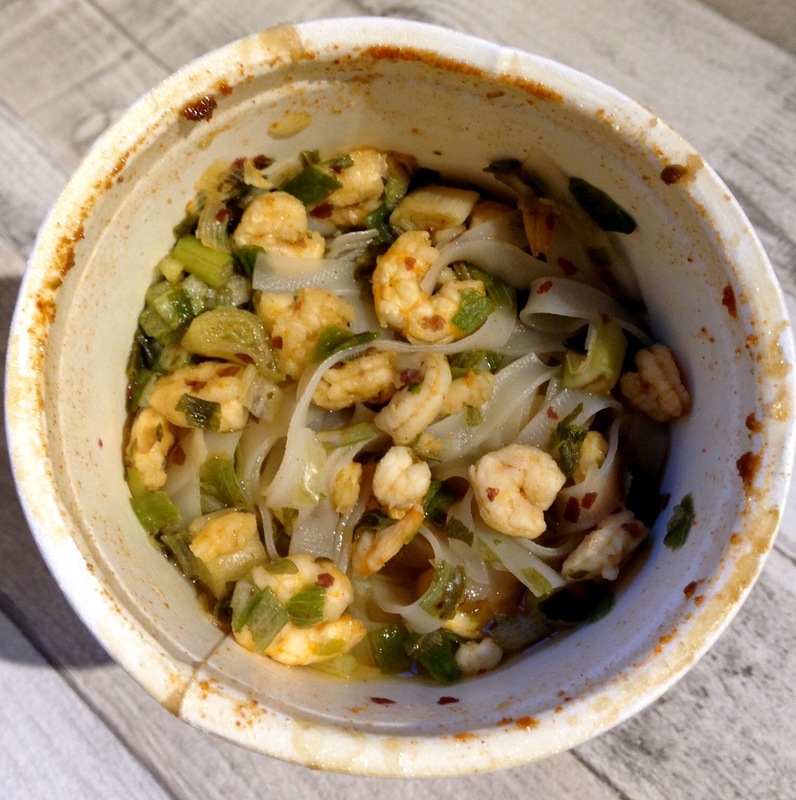 As far as ‘fast food’ goes, Mr Lee’s Noodles are a healthy option that you can easily incorporate into the food optimising lifestyle. Mr Lee’s Noodles (and there is a real Mr Lee behind them) are not currently available in supermarkets but you can buy them online at: www.mrleesnoodles.com. Disclaimer: I was sent a box of Mr Lee’s Noodles in return for an honest review. The above reflects my genuine opinion of the product.